Active Vision explores important themes emerging from the active vision paradigm, which has only recently become an established area of machine vision. 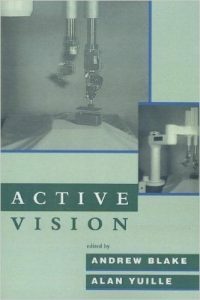 In four parts the contributions look in turn at tracking, control of vision heads, geometric and task planning, and architectures and applications, presenting research that marks a turning point for both the tasks and the processes of computer vision.The eighteen chapters in Active Vision draw on traditional work in computer vision over the last two decades, particularly in the use of concepts of geometrical modeling and optical flow; however, they also concentrate on relatively new areas such as control theory, recursive statistical filtering, and dynamical modeling.Active Vision documents a change in emphasis, one that is based on the premise that an observer (human or computer) may be able to understand a visual environment more effectively and efficiently if the sensor interacts with that environment, moving through and around it, culling information selectively, and analyzing visual sensory data purposefully in order to answer specific queries posed by the observer. This method is in marked contrast to the more conventional, passive approach to computer vision where the camera is supposed to take in the whole scene, attempting to make sense of all that it sees.